The first (and until recently, last) time I read George Orwell's dystopian novel 1984 was during the most influential unit of study I experienced in high school, in Mrs.Price's 10th grade Honors English class; a unit on Utopia/Dystopia. We read books like Thomas More's Utopia, Orwell's 1984 and Animal Farm, Aldous Huxley's Brave New World & William Golding's Lord of the Flies, to name but a few. At the time, of Orwell's two, Animal Farm made the greater impact. The last line has stuck with me to this day: "The creatures outside looked from pig to man, and from man to pig, and from pig to man again; but already it was impossible to say which was which." But after the revelations about the NSA's widespread spying on Americans, I decided it was time to reread 1984. I graduated from Duke the year by which all the dire prophecies in the novel were supposed to have transpired. We used to joke about it. But we graduated without Big Brother and the Thought Police - at least to the best of our knowledge. Next year is my 30 year reunion, and in light of what we know thanks to whistleblower Edward Snowden (and yes, I do consider him a whistleblower, not a traitor, because without him we would never be having these very necessary conversations) it is a very different story. Re-reading 1984 again thirty-five years after I read it in high school is uncanny, because the world has drifted so much closer to the dystopia Orwell imagined. Emmanuel Goldstein, 1984's "Enemy of the People" and the subject of the 2 minute Daily Hate, writes in his manifesto about how in the past, science and technology were leading to an all-round increase in wealth which "threatened the destruction of a hierarchical society. "Once it became general, wealth would confer no distinction. It was possible, no doubt, to imagine a society in which wealth, in the sense of personal possessions and luxuries, should be evenly distributed, while power remained in the hands of a small privileged caste. But in practice such a society could not long remain stable. For if leisure and security were enjoyed by all alike, the great mass of human beings who are normally stupefied by poverty would become literate and would learn to think for themselves; and when once they had done theys they would sooner or later realize that the privileged minority had no function and they would sweep it away. In the long run, a hierarchical society was only possible on a basis of poverty and ignorance. The problem was "how to keep the wheels of industry turning without increasing the real wealth of the world. Goods must be produced, but they need not be distributed...In practice the only way of achieving this was by continuous warfare." "And we will lead by having the highest standards, by setting an example of human rights and civil rights, due process and rule of law, which is why I will close Guantanamo. I will restore habeas corpus. And we will end torture and rendition because you will have elected a president who has taught the Constitution and believes in the Constitution and will obey the Constitution of the United States of America." I'm not sure whether to laugh or cry when I read these words now. What I can tell you is that my disillusionment with politics and government are at an all time high - and I've been a political writer for the last ten years. "War...not only accomplishes the necessary destruction, but it accomplishes it in a psychologically acceptable way...It is precisely in the Inner Party that war hysteria and hatred of the enemy are strongest. In his capacity of administrator, it is often necessary for a member of the Inner Party to know that this or that item of war news is untruthful, and he may often be aware that the entire war is spurious and is either not happening or is being waged for purposes quite other than the declared ones, but such knowledge is easily neutralized by the technique of doublethink. Meanwhile, no Inner Party member wavers for an instant in his mystical belief that the war is real." When I read this, I recognized what I regarded as the unfathomable vitriol poured on Edward Snowden by some people on the left. He desparaged and called a traitor by folks that I knew damned well would be praising him as a hero had this happened on Bush's watch. And call me Winston (or Julia if you want) but that made me sick beyond measure - and even more disillusioned with politics and political people. It's one of the many reasons I'm now unaffiliated instead of a "party member." If doublethink is what it takes to be a good party member, then being in a party isn't for me. Think I'm wrong about this? Let's review: Thanks to Snowden, we know Director of National Intelligence James Clapper lied to Congress DNI Clapper lied to Congress (why hasn't he been prosecuted? ), that the NSA has been collecting metadata on American citizens phone calls, social connections, collecting email address books and buddy lists. Yesterday we found out that the NSA hacked into Mexican President Felipe Calderon's emails. Can't wait to hear the Newspeak contortionist justifications for that. This morning, Le Monde reports that the NSA spied on 70 million phone calls in France in just 30 days and captured millions of text messages. Le Monde issued an editorial today entitled: FIGHTING BIG BROTHER. 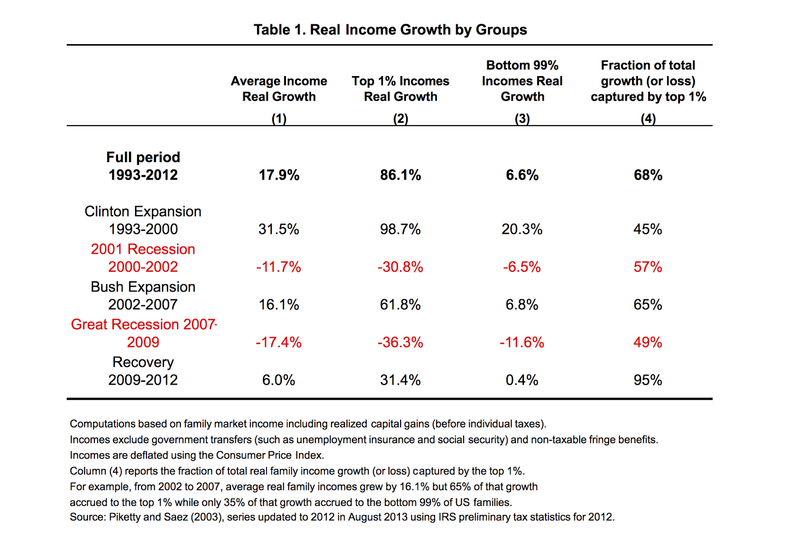 But let's also look at the wealth aspect of this. Thanks to the trickle down Voodoo economics that didn't trickle down and the continuous warfare, we've now got the widest wealth gap since the Roaring 20's. 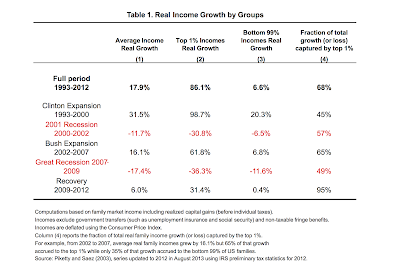 Look at this interesting chart of real income growth particularly coming out of the recovery from the 2008 financial debacle. You know, the one where our taxpayer dollars went to bail out Wall Street for their lack of due diligence? That crisis? "The Party seeks power entirely for its own sake. We are not interested in the good of others, we are interested solely in power." I won't go so far as to say both parties are as bad as each other, because, quite frankly, what the Tea Party wing of the GOP almost pushing us to default would have given my staunchly Republican father pause,and the whole creationism, anti-intellectual War on Women thing is just...well, as those awesome old Crazy Eddie ad say, "IN-SAAAANE". But enough has happened in the Democratic party on the local level and certainly on the national level with their full throated embrace of corporate education reform, and as I stated above, the doublethink condemnation of Snowden, that earlier this year, with that final line of Animal Farm echoing in my head, I went to Town Hall and changed my registration to Unaffliated. Where I do blame both parties is their choice to make teachers and labor unions the Emmanuel Goldstein's of the US's internal war in an attempt to decimate the middle class. "There are only four ways in which a ruling group can fall from power. Either it is conquered from without, or it governs so inefficiently that the masses are stirred to revolt or it allows a strong and discontented Middle Group to come into being, or it loses its own self-confidence and willingness to govern. Continuous warfare eliminates the first problem. The masses never revolt, Goldstein says, "because they are oppressed...From the point of view of our present rules, therefore, the only genuine dangers are the splitting off of able, underemployed, power-hungry people, and the growth of liberalism and skepticism in their own ranks. The problem, that is to say, is educational. It is a problem of continuously molding the consciousness both of the directing group and of the larger executive group that lies immediately below it. The consciousness of the masses needs only to be influenced in a negative way. So we have those with power and wealth - in BOTH PARTIES - creating "No excuses" edreform doublethink in an attempt to distract us from the real problem - wealth inequality and inequality of resources which propagates educational inequality, which only propagates more wealth inequality. whose aim is to create a Big Brother like database of our children's information without parental consent. InBloom was developed in conjunction with Wireless Generation, a Rupert Murdoch company. You remember Rupert Murdoch. The guy who respects privacy and basic decency so much his reporters hacked into a murdered girl's cell phone? In May 1944, George Orwell wrote a letter which presages many of the themes that show up in 1984. "Intellectuals are more totalitarian in outlook than the common people. On the whole the English intelligentsia have opposed Hitler, but only at the price of accepting Stalin. Most of them are perfectly ready for dictatorial methods, secret police, systematic falsification of history etc. so long as they feel that it is on ‘our’ side..You also ask, if I think the world tendency is towards Fascism, why do I support the war. It is a choice of evils—I fancy nearly every war is that...I think, and have thought ever since the war began, in 1936 or thereabouts, that our cause is the better, but we have to keep on making it the better, which involves constant criticism. That's why I need to be unaffliated for now. Because it appears that "toeing the Party line" means having to employ doublethink - to be willing to justify things you would excoriate when the other party is in power in order to keep your party in power. Like Winston, I still believe that there is truth. That 2 + 2 doesn't equal 5, no matter how much Newspeak and Doublethink is employed to tell me otherwise. I'm grateful to my parents and to my teachers for teaching me the critical thinking skills, and to my parents and extended family for leading by example that we should stay true to our values. I just hope the kids in today's K-12 Orwellian test crazy edreform world are able to emerge with similar skills.